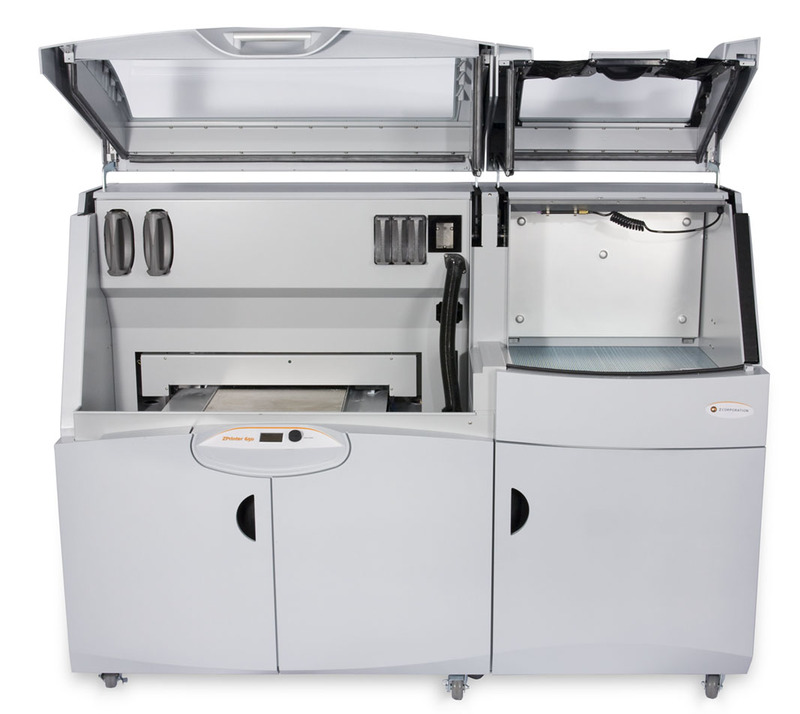 At Sparx Engineering, we heavily rely on our 3D printers for rapid prototyping. It’s very rare to not hear at least one of our 3 machines printing something. 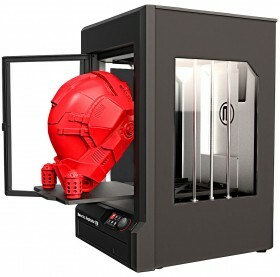 Some days it’s the ultra-high resolution Z-Printer 650, the small Cube 2 3D, or the new MakerBot Replicator Z18. 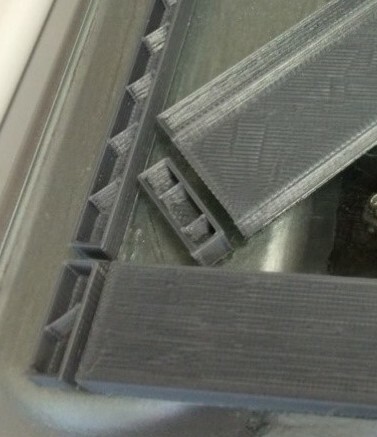 3D printers are great for prototyping systems. They offer very quick feedback on designs regarding fit, appearance and functionality. 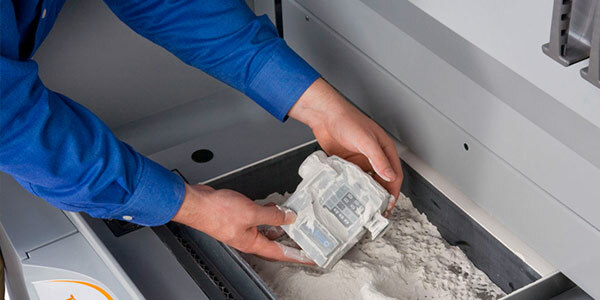 Additionally, many times the printed part is strong and accurate enough to be directly used in your system. 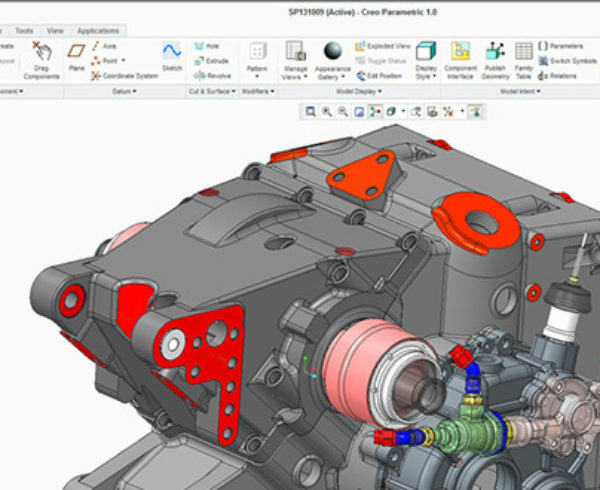 Instead of designing a part in a CAD tool, sending it off to a fabricator, approving the returned drawings, issuing a PO, waiting for the part to be fabricated, then waiting for it to arrive – you can simply CAD up a model and print it in a few hours. 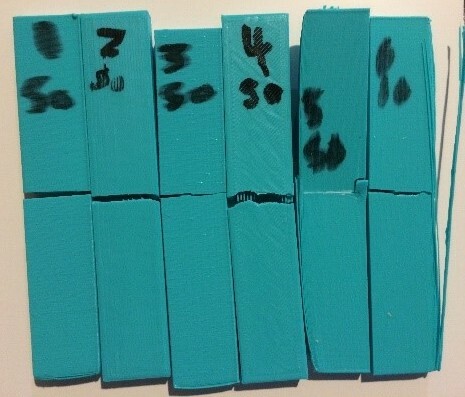 If the design has an issue, simply tweak the model and reprint. 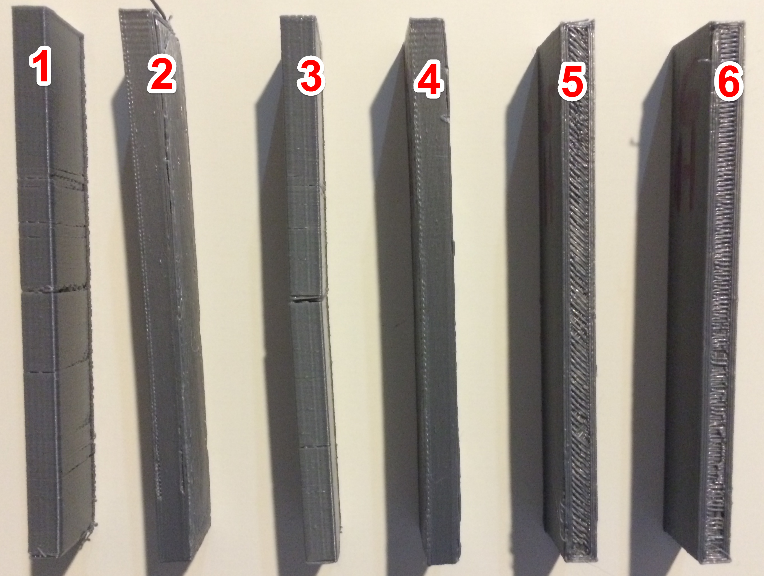 A failed 3D print will cost you a few bucks in PLA, a failed 3rd party fabrication will cost you hundreds, not including the time potentially wasted waiting on it to be complete. Personally, I’m absolutely fascinated with the technology and where it is going. The strength of PLA printed parts is generally good. 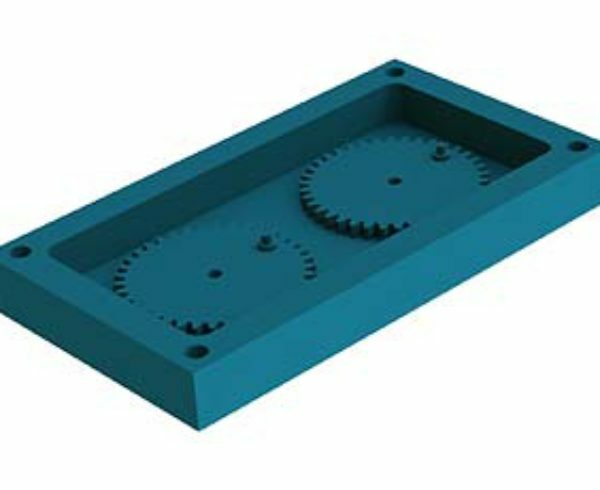 It is certainly nowhere near the strength of injection molded plastic or machined metal parts, but is plenty strong for printing brackets, custom parts, or motor mounts. 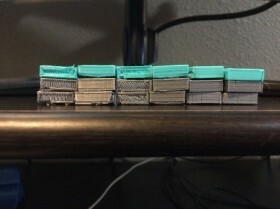 Lately, I have been using a Cube 2 3D printer from 3D Systems for many of my prototype components. 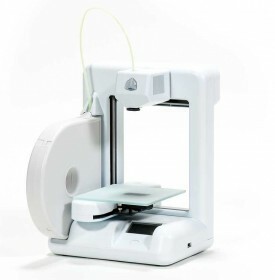 The Cube 2 3D printer is a simple machine that is very easy to use. The software interface is a bit too dumbed down for my liking, but it gets the job done. 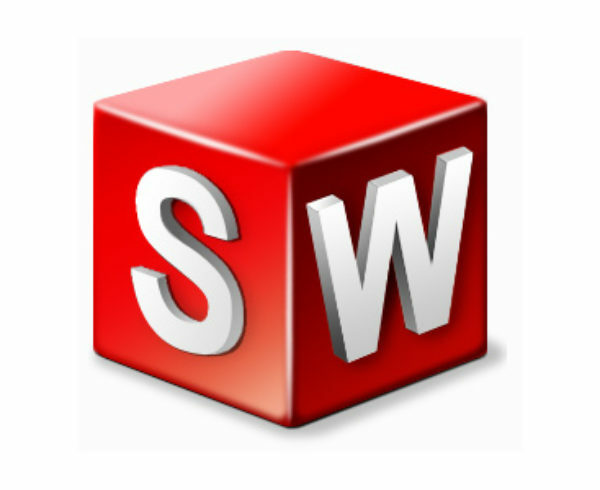 The software has limited options and those with experience using Slic3r and GCode may find it almost childish. It is mainly used to orient parts for printing and setting the print density. 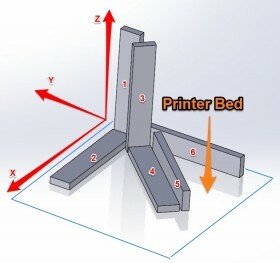 Many 3D printers use GCode for the printing instructions. 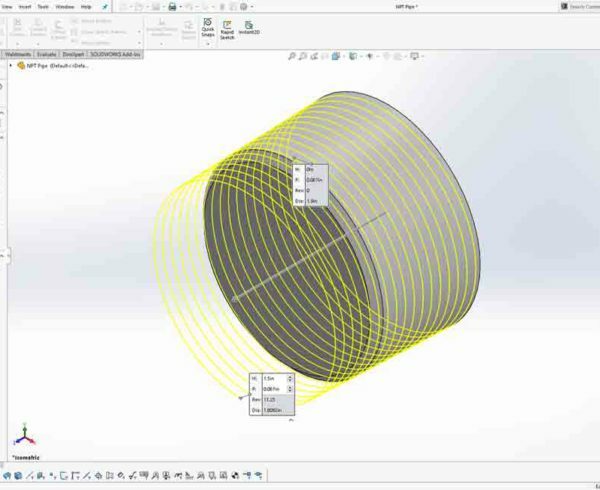 With GCode, you can visualize each section of a print in 2D, layer by layer, revealing path and even speed that the nozzle will take to create the object. The Cube-3D printer uses a proprietary intermediate file type for printing instructions. This file does not show the direction of the lines of PLA as printed. 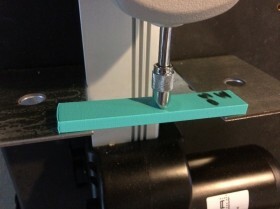 However, after using the printer for a while you can predict the nozzles path for most objects. 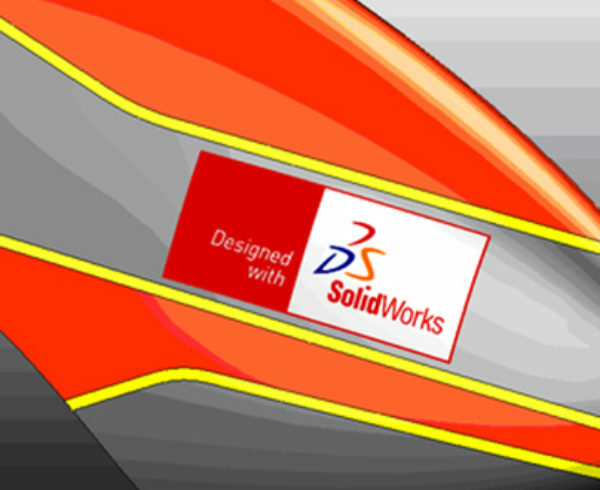 With the Cube3D software you have the choice of print density and can select between “hollow”, “strong”, and “solid”. The “hollow” option will fill print a thin outside shell with a very light pattern of PLA that adds some structural rigidity to the object. The Strong option prints a relatively heavier shell and a heavier pattern adds significantly to the objects rigidity. 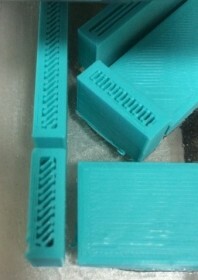 The Solid option prints a very thick shell and a very dense fill pattern. It isn’t exactly “solid” but any more would be a waste of material. Strong is certainly the most rigid option, but it uses quite a bit more PLA and takes nearly 2.5x the time to print as Hollow. This option should only be used if absolutely necessary. 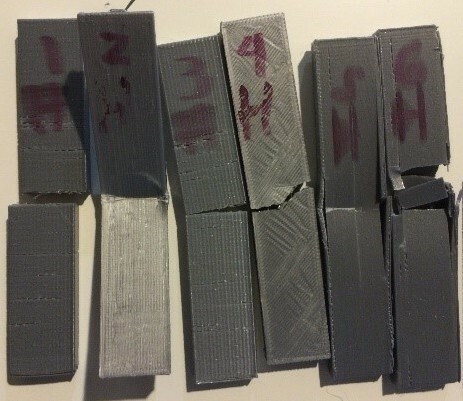 As I gain experience in 3D printing technology I have come to see that the orientation of how an object is printed has quite an impact to the strength of the object. 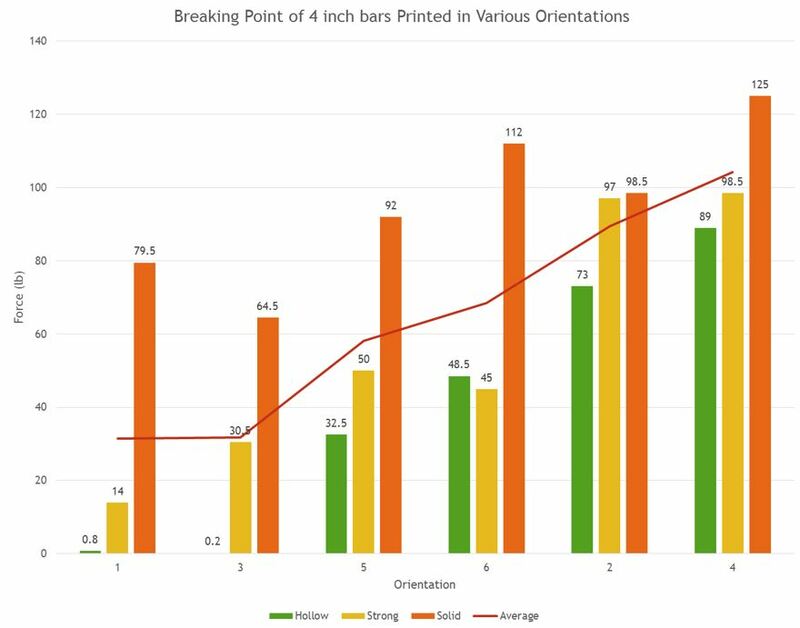 In some cases, print orientation can contribute just as much to the strength of a print as the density. 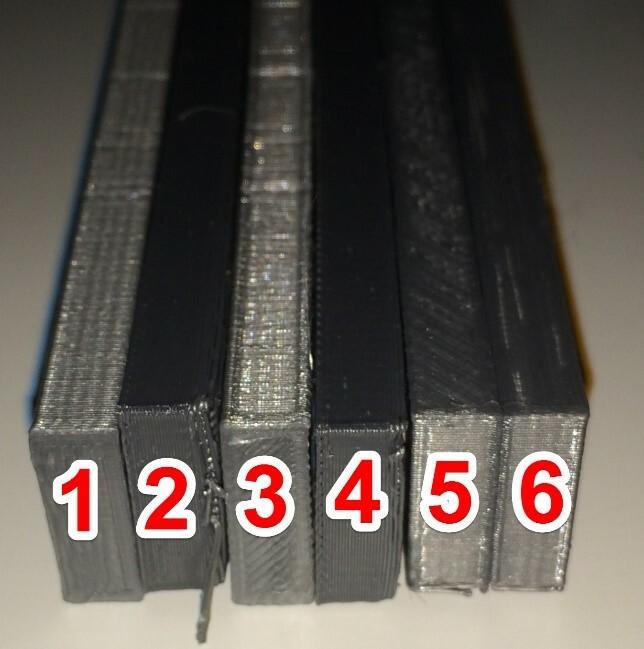 This post will analyze how both filling density and orientation contribute to an objects relative strength by measuring the force required to break a 4” x 3/4” x 1/4” printed part. 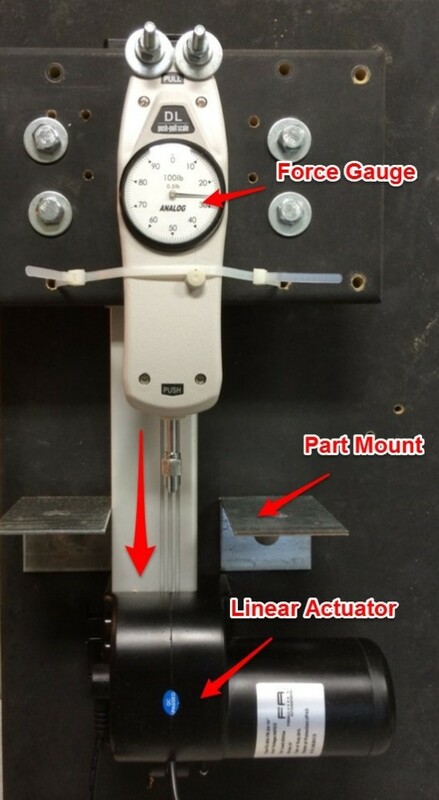 To test the relative strength of part orientation I am using a Heavy Duty 200lb Firgelli Automation Linear Actuator and an Analog push-pull force meter. I simply mounted the force gauge on the linear actuator and added two braces on the test stand to support the part. The Force Meter is driven into the center of the part which is supported on both ends. 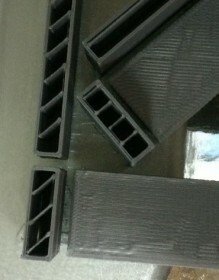 I picked a variety of part orientations to test. Here is a labelled illustration of the various orientations of the 4” bar. 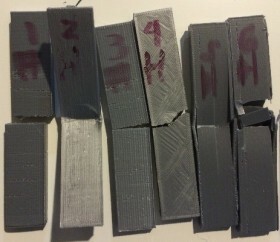 The final printed pieces are below along with a rough sketch depicting the print lines for each orientation. You can see the differing patterns on the faces of the parts due to the orientation. Here are each of the samples after the tests were completed (Hollow, Strong, Solid). These illustrations show how differently the parts bread due to the varying print orientation. The chart below illustrates the results of the test. The part that performed the best was orientation 4 (Flat at 45 degrees from the x-axis). 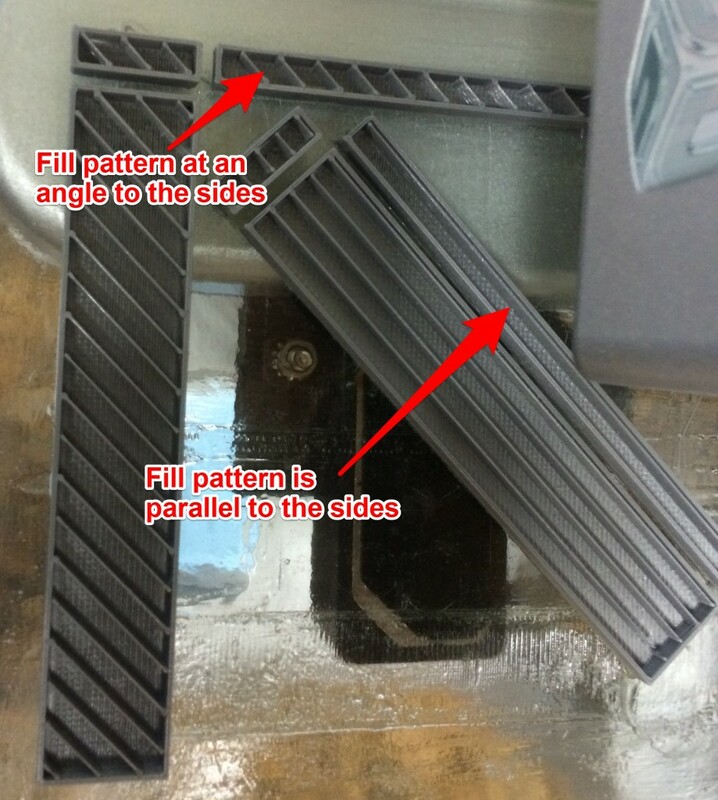 The rigid surface that was printed at a 45 degree angle to the edges of the part gave the part the ability to handle internal stresses from more than 2 directions. Even the Hollow print of this orientation required almost 90 lbs of force to snap (compared to <1lb for orientations 1 and 3). 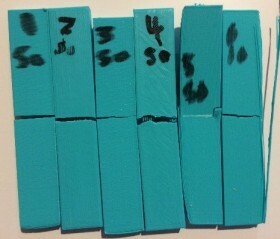 Orientation 1 and 3 were the poorest performers because the printed lines on the faces of the part paralleled the edges. 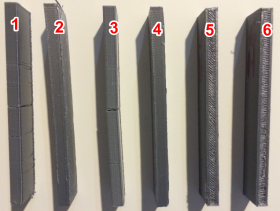 This pattern relied on the bonding strength of parallel PLA lines, which results in minimum adhesion area. 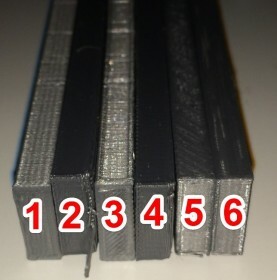 For the Hollow prints of this orientation, there was only 2 layers of bonded PLA to take the pressure. 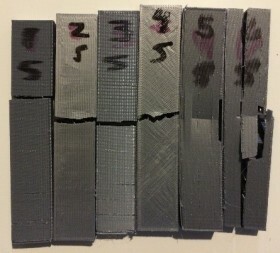 The force required to break barely registered on the force Gauge (< 1lb). The prints of Solid density were all relatively rigid regardless of orientation. 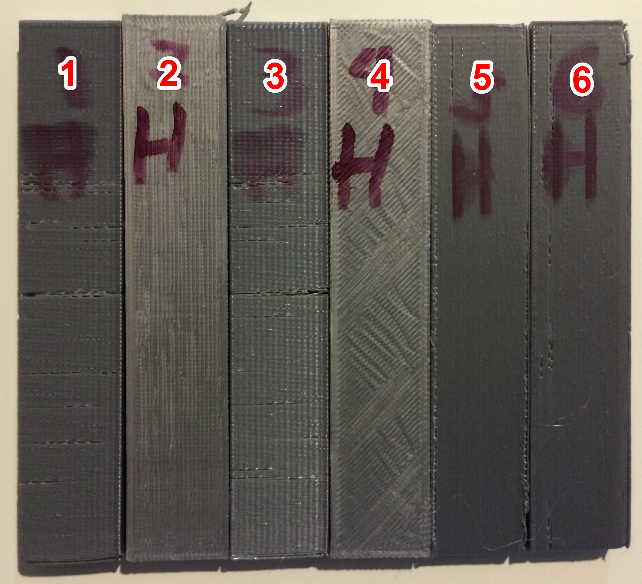 However, as noted above, the print time and PLA use was far greater than the other fill types. 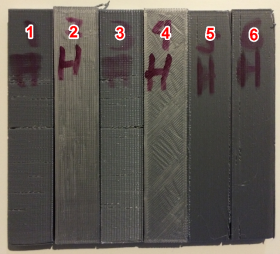 The information from this little experiment should give you a better understanding as to how to position your parts for printing. 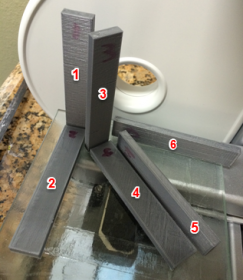 It may be as easy as rotating your part 45 degrees to more than double the strength of your print. Or, if you don’t mind the excess material use and long print times, you can’t go wrong with the “solid” print density configuration. Thanks! It would be great to see more materials used with the same tests. Hello, thank you for the info, On the cube 2 dose the x axis control the print bed going forward and back, and the Y axis is where the extruder goes left to right? I am asking because I have a dead cube 2 a friend gave me, the mother board was damaged by water spill.. so I am using a ramps 1.4 board, and I want to configure correctly. 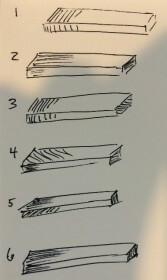 Please correct me if I’m wrong, but wasn’t orientation 5 the only one at any kind of an angle and 6 was completely parallel to the edges? If so, why would this be the case? Perhaps it has to do with 6’s longer grains distributing more of the weight?